The item for sale is 4 Ounces of Ferric Chloride (FeCl3) Anhydrous. Ferric Chloride Anhydrous is commonly used as an etchant. To make a powerful etching solution for Printed Circuit Boards, add 4 ounces of Ferric Chloride to 1 liter of distilled water. Etching speed will depend on concentration, temperature, and agitation. For other popular etchants, including Ammonium Persulfate and Copper Sulfate, check out our other listings. CAUTION: Add the dry powder little-by-little to a larger volume of water. 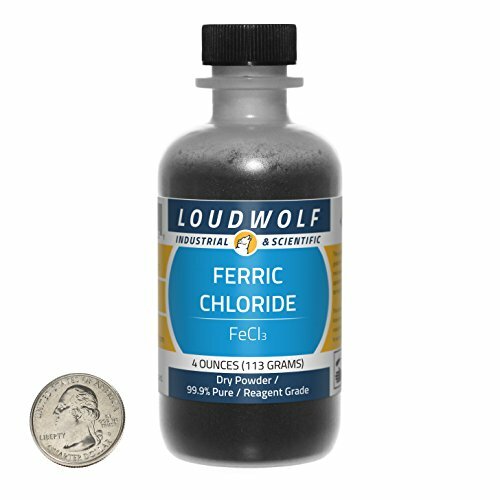 Ferric Chloride produces a great deal of heat when wet. Never add water to the powder. Ferric Chloride will also fume in moist air. It is highly hygroscopic and can absorb enough moisture from the air to dissolve itself into a liquid. STURDY PLASTIC BOTTLE: Our bottles are made of durable Polypropylene Plastic, which is a natural, translucent, lightweight, durable, and chemically resistant copolymer. The screw-top is completely leakproof. The bottles' round shape makes them a perfect addition to any shelf or travel kit. Every bottle we ship is sealed in plastic with the screw-top shrink-wrapped. HUNDREDS OF USES INCLUDING: PCB Etchant / Steel Knife Etchant / Silver Etchant / Copper Printing Plate Production / Photographic Chemical / Metal Weathering Agent / Flocculant / Water Treatment / Chemical Reagent / Desiccant / Iron and Steel Surface Treatment. SHIPS FAST FROM CALIFORNIA, USA: We ship three times a day, seven days a week. This item will be in the mail the same day you place your order. Applicable products are packaged and shipped in accordance with carrier regulations for ORM-D classification. If you have any questions about this product by Loudwolf, contact us by completing and submitting the form below. If you are looking for a specif part number, please include it with your message.